Kanye West is the kind of artist to always one-up himself whenever it comes to how big of a production he can make, whether that’s on an album, or merely promoting it. Before the release of My Beautiful Dark Twisted Fantasy, he released one free (mostly non-album) track per week via his G.O.O.D. Fridays series, and draped the SNL set in white to perform, backed with a troupe of ballet dancers. He’s also performing on SNL tonight, so we’ll see what he does. 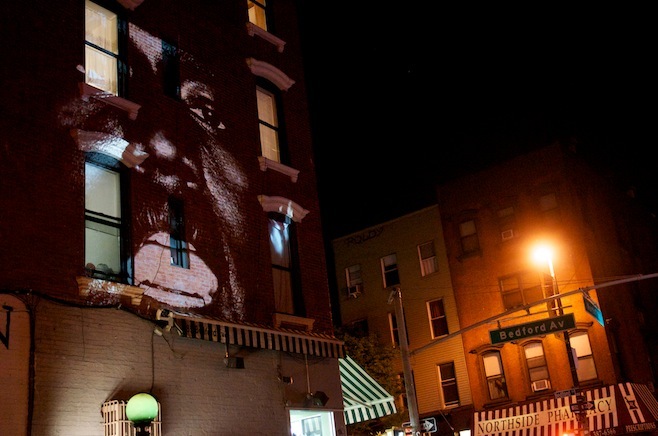 But in the meantime, Kanye has debuted a brand new song titled “New Slaves” by projecting a video onto the side of a building in Brooklyn. On his website, Kanye West has posted a map of the world detailing times and places of similar launch events. There are 66 projections planned in all. Watch the full video for “New Slaves,” which is likely to appear on Kanye’s next album, below.